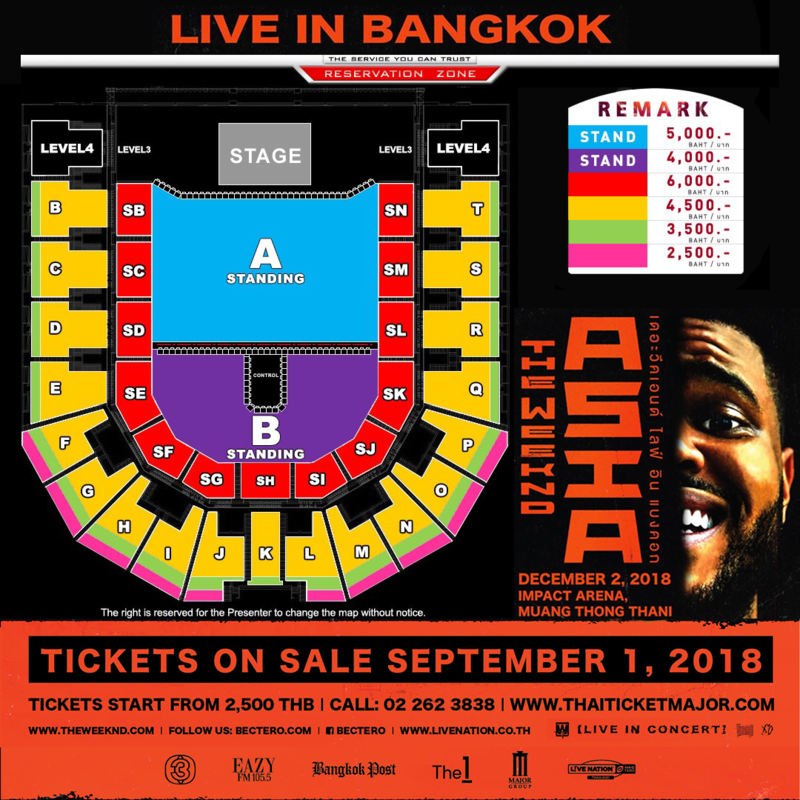 Grammy Award®-winning and multi-platinum selling music artist The Weeknd has unveiled details behind his first-ever tour in Asiawhich includes Thailand.The Weeknd Live In Asia will kick off on Friday, 30 November in Hong Kong, and visit6 additional cities across Asia including Singapore, Manila, Taipei, Seoul, Tokyo,and Bangkok on Sunday, 2 December 2018.Tickets go on sale on Saturday, 1 September 2018 at ThaiTicketMajor. 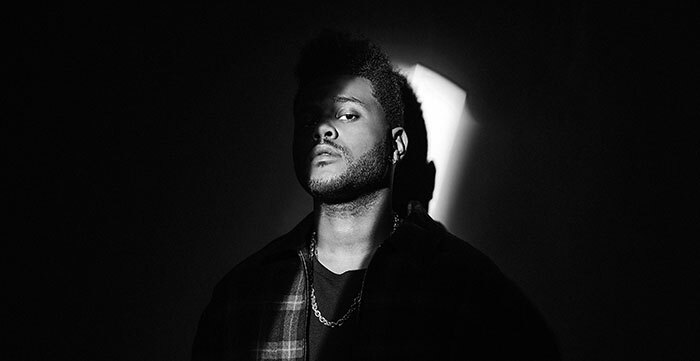 The tourwill support the genre-spanning artist’s highly-acclaimedprojects – Beauty Behind the Madness, Starboy, and My Dear Melancholy – all of which have been littered with chart-topping hits. “Acquainted” [platinum]. “Earned It (Fifty Shades of Grey)” even garnered The Weeknd his first ever Academy Award® nomination in the category of “Best Original Song.” The Weeknd’s fourth full-length album Starboywas released in November 2016, and the title track featuring Daft Punk broke the record for “Most Release Weekend Streams Ever” upon its release. In less than a week, the single amassed over 17 million streams globally and 6.5 million streams in the United States, becoming #1 Most Added at Top 40, Rhythm, Urban, and Hot AC. 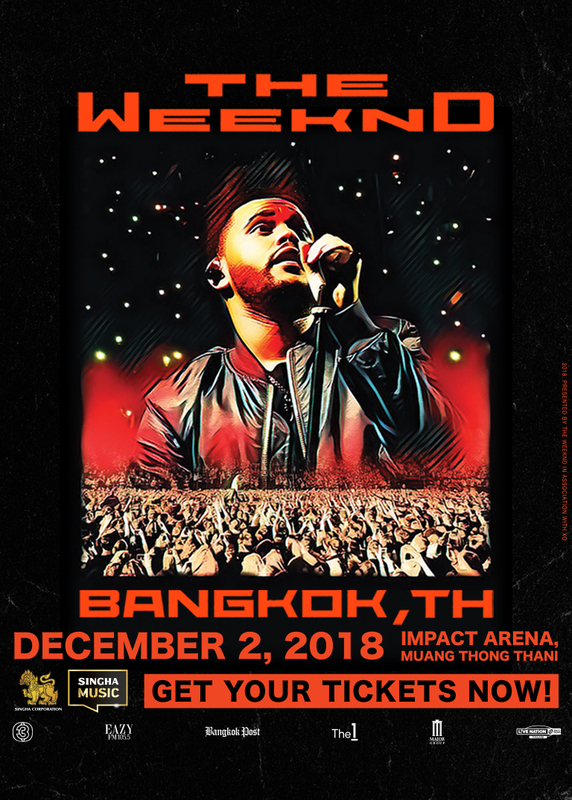 Don’t miss “The WeekndAsia Tour Live in Bangkok” for the first time everon 2 December 2018 at Impact Arena, Muang Thong Thani.Ticket prices start at Bt2,500.For more information, please log on to www.thaiticketmajor.com or call 0-2262-3838. For latest updates, please log on to www.bectero.com or follow us on www.facebook.com/bectero, Twitter @BEC_Tero_Ent, and Instagram @BECTERO_ENTERTAINMENT. 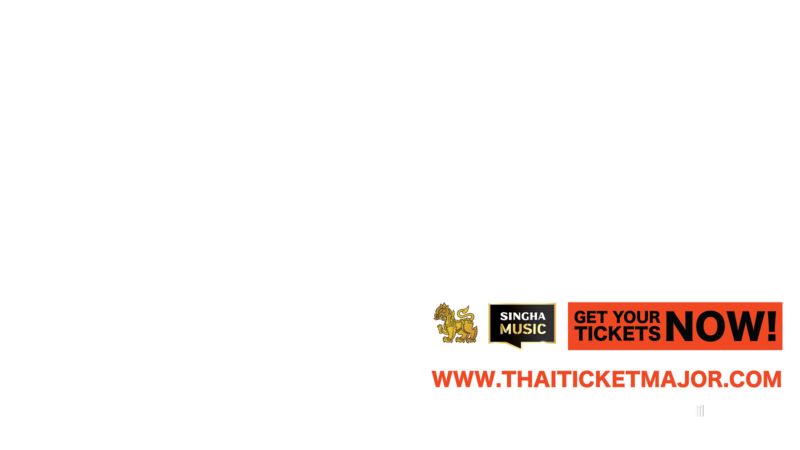 Download SINGHA PLUS application from App Store or Play Store. Register and click andget Pre-sale code on the application. Use the code to accesspre-sale event on 29 August from 10.00 am to 30 August 10.00 pm. Applicable only at ThaiticketMajor 13 main branches and online at www.thaiticketmajor.com. Limited number of codes available. A maximum of 2 tickets can be purchased per 1 code. Limit number of tickets available base on first come first serve basis. *Reservations through the call center are not available, and online purchases through www.thaiticketmajor.com can be made by credit card or debit card only. Apply for Live Nation membership at www.livenation.co.th and subscribe our newsletter before 29 August 10:00pm.to get pre-sale code. Use code to access pre-sale event on 31August 2018 from 10.00am. 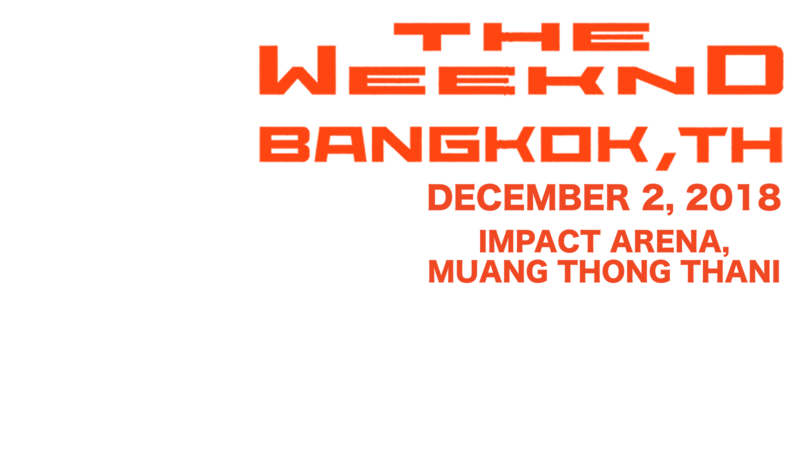 to 10.00pm.only atThaiticketMajor 13 main branches and online at www.thaiticketmajor.com. A maximum of 2 tickets may be purchased per one transaction.Limit number of tickets available base on first come first serve basis. *On 1 September between 10:00-12:00hrs reservations through the call center are not available, and online purchases through www.thaiticketmajor.com can be made by credit card or debit card only. Tickets purchased cannot be resold, refunded or exchanged. Tickets are the property of the Organizer and cannot be transferred or resold for commercial gain. 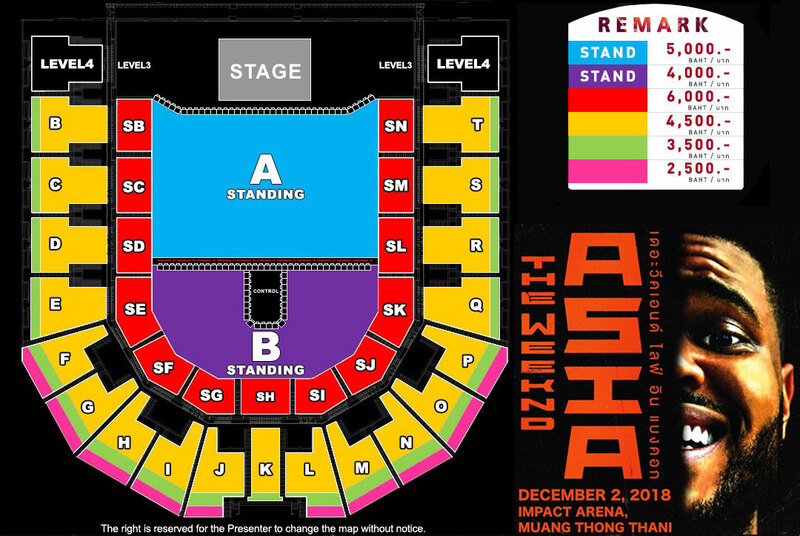 The resale of ticket(s) is prohibited. Organizer reserves the right to cancel the ticket with no prior notice and with no refund or other compensation. Suitcases, backpacks, tablets larger than 7 inches, selfie sticks, professional cameras, audio/video recording devices are prohibited and there will be no deposit point service provided at the venue.